Listen to a story about the new wave of Jewish cuisine. If you missed our Twitter chat about Jewish cuisine and Jewish delis, catch the recap here. Ted Merwin didn't set out to become a deli historian. About ten years ago, Merwin was working on his Ph.D. dissertation about the popular culture of second generation Eastern European Jews -- such as vaudeville and silent comedy -- in 1920s New York. "I realized a lot of these vaudeville routines took place in delicatessens and I wondered why the delicatessen was such a popular setting for American Jewish culture," he says. That launched a new research project. 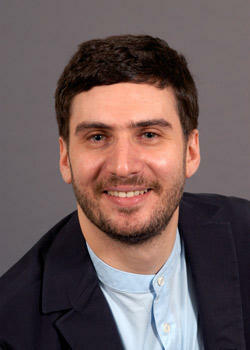 Now Merwin, a Judaic Studies professor at Dickinson College in Penn., is also a deli scholar. He gives talks around the country on the subject and has a large collection of deli menus and memorabilia. Merwin is working on a forthcoming book, "Pastrami on Rye: An Overstuffed History of the Jewish Delicatessen." He shared with us some of what he's learned about key moments in deli history. Delis thrived on Miami Beach after World War II. 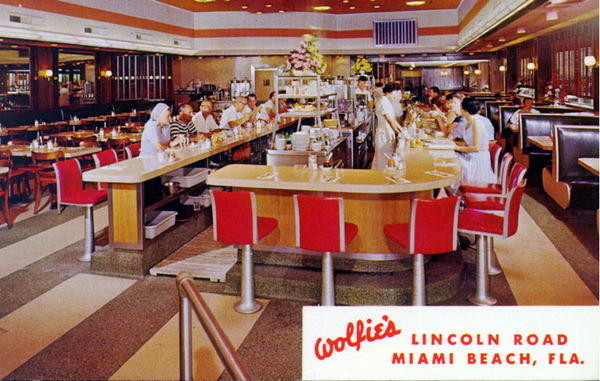 People lined up to eat at Miami Beach delis like Wolfie's, Wolfie Cohen's Rascal House, Pumpernick's and Junior's. "There are certain cities that became deli towns and others that didn't and I'm still figuring out what makes a place known for its delis. "I think there are different factors in different places--they thrived in places where Jews lived in very close proximity to each other. In Brooklyn and on the Lower East Side, there was fertile ground for delis and other kinds of Jewish restaurants. "In South Florida, the Jews were all pretty much on Collins Avenue and Washington Avenue--there were real Jewish neighborhoods all along the ocean after World War II. The Jews who spent time in Florida over the winter were from Philadelphia, Baltimore and other northern cities, but they were mostly New Yorkers for whom the deli was a central feature of New York life. People joked that Miami was like a sixth borough of New York. It was like New York with sand. I think it was inevitable that Jews who spent so much of their leisure time in delis in New York would popularize delis in Miami Beach." "You don't see people sitting around on 'Fiddler on the Roof' eating pastrami sandwiches." Delis around the country functioned as community spaces. "I'm not so much into deli food as I am into studying the deli as a communal gathering space. Obviously the food mattered and it was identified with Jewish heritage, although it was not what people were really eating in Eastern Europe -- you don't see people sitting around on 'Fiddler on the Roof' eating pastrami sandwiches. "The second generation of Jewish immigrants really made the deli an important gathering space. 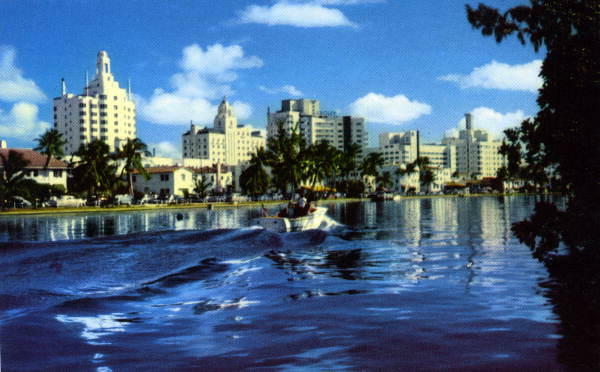 That was the generation that went to Miami and Miami Beach after World War II. "Jews were becoming less observant and being kosher became less important, but Jewish food became an important way to become connected with their identity." Postcard of Hotel Row and Indian Creek in Miami Beach from sometime after 1948. Delis signified that Jews had "arrived" in American culture. "Jews celebrated their arrival in the mainstream of American society at delis. Of course, Jews were very active in the entertainment scene. You would go to the deli to try to rub shoulders with some screen star. There would be photos on the wall of great entertainers of the day. 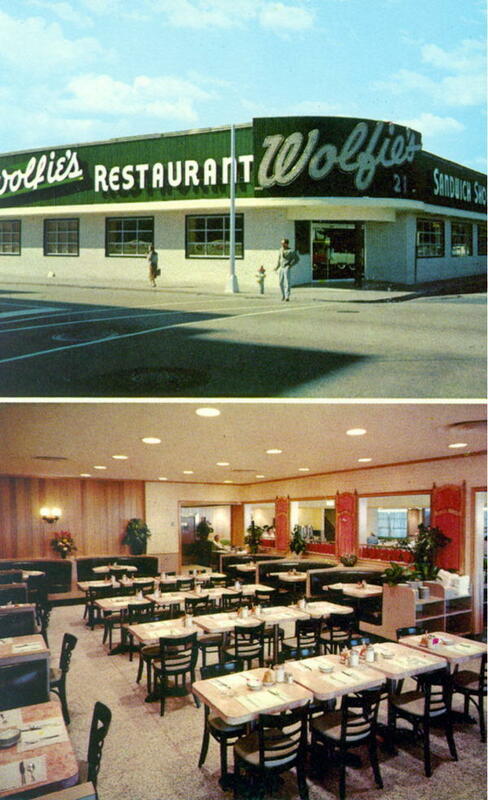 This was very much a part of the Miami Beach experience of delis as well, because the entertainers were here during the winter doing shows in the theaters. "There was a sense of wanting to feel important, of beginning to make it, even though there was still quite a bit of anti-Semitism. "Delis were a bridge between Jewish culture and American culture -- they all about abundance and glamour, all about a feeling on entitlement -- which was very American. These overstuffed sandwiches were a symbol of the American dream." Delis waned in importance for many reasons, including assimilation and health concerns. "Jews still eat bagels even though bagels are the most American food you can think of but I don't know that Jews feel particularly Jewish eating them. That's happening to pastrami now -- now every place has pastrami. People are forgetting that it has any kind of Jewish derivation -- not that it did originally. It was originally Romanian. "Part of it was also that there were other ethnic groups that started to come to the fore in the 1960s and Jews started eating all kinds of food like Italian and Chinese." "The Jewish food didn't have that special cache anymore. Jews didn't identify it with celebrity -- it became more lower class and plebeian fare. "As the health movement took off in the late 1970s, deli food was associated with high fat and sodium. It was not the kind of food that comported itself with Jews' image of themselves as fit, healthy Americans. Deli food tends to be garlicky, smelly, gassy and who wanted that? People started to worry about their hearts and arteries. "Not that they disappeared, but delis certainly weren't the places Jews were eating at every day and every week. "The other part of it was that these were mom-and-pop businesses that the children of the deli owners ran as far away from as they could. This was backbreaking work. You had big sides of beef you had to lug down to brine in big barrels -- very hard work. They wanted their children to be professionals." There's a small second wave of delis opening around the country, including Wise Sons in San Franscisco, Mile End in Brooklyn, DGS Delicatessen in Washington, D.C., and Josh's Deli in Surfside. "I think it remains to be seen how successful it will be to try to bring the deli into the modern age and give young diners what they want -- serving things like homemade soda, organic produce, smaller portions, grass-fed beef. "I think these are delis that largely depend on a non-Jewish clientele, which really is true for older delis, as well. The problem with a younger clientele is that people always want to know the latest and newest and don't necessarily stick with a new place too long. "There's so much that goes into having a successful food business and into reaching out to a non-Jewish clientele for a food they don't identify with their heritage. "I don't know if in the absence of a role as a gathering place for the Jewish community, this new kind of deli just becomes any other kind of restaurant. I don't think the deli is serving the same role as it once served." To learn more about the history of Jewish cuisine in South Florida, check out the exhibit, "Growers, Grocers & Gefilte Fish: A Gastronomic Look at Florida Jews & Food" at the Jewish Museum of Florida. Special thanks to David Sax, journalist and author of "Save The Deli," and Ira Sheskin, University of Miami professor, for their assistance with research for our Jewish cuisine stories. This year's Thanksgiving celebration coincides with the first day Hanukkah, the Jewish festival of lights. It's a convergence that hasn't occurred since 1888 and which may not occur again for more than 70,000 years. Jokes about Manischewitz-hued turkeys aside, this is a fabulous opportunity to mingle two great food traditions. Click the play button above to hear the radio version of this post by Norman Van Aken. What do you do with a word like aïoli the first time you see it in print? If you don’t grow up versed in languages containing umlauts, It’s confusing for sure. Maybe I resisted learning much more until I started cooking and I discovered how good a word with an umlaut could taste! The first time I made an aïoli I was in Key West, not sunny Provence from whence she likely shone first. But the sun connected us through the gypsy medium of garlic! Although less than 2 percent of Miami-Dade County's population is Asian-American, Danielle Chang, founder of the Lucky Rice Festival, decided her party had enough appeal last year to come back to Miami Beach for a second round.